"Non-Gaussianities in the temperature fluctuations of the Cosmic Microwave Background" sounds like a perfect conversation topic to put your date to sleep, but if you have an interest in Cosmology or Quantum Gravity, it's definitely something you should have heard about. The Cosmic Microwave Background (CMB) is radiation we receive today from a time when the universe was about 300,000 years young. At that time, radiation decoupled from matter and since then, photons could travel almost undisturbed. The CMB shows the temperature, or the inverse wavelength, of the microwaves that we receive on Earth from these early times. We have discussed the features and usefulness of the CMB temperature fluctuations a few times already, see e.g. my earlier posts The CMB Power Spectrum and Anomalous Alignments in the CMB. One way to extract information from the data is to look at correlation functions. These come in integer orders like the two-point function, the three-point function, the four-point function etc. There also is a one-point function but ‒ assuming a homogeneous probability distribution ‒ you already know it: it's just the expectation value. In our case, it would be the mean temperature. The two-point function tells you something about the correlation length in the distribution. The relevant quantity we are concerned with here is the three-point function. (Confusingly enough the three-point function is also known as bi-spectrum.) To compute it, you roughly take three different points of your distribution, multiply the value of the function (here the temperature), and integrate over combinations of three points. Even from this rough description you can notice two things. First, it's several ugly integrals that are hard to compute, especially with loads of data. Second, multiplying small numbers makes even smaller numbers, thus the result is in risk of dropping below the uncertainties in your measurements. Therefore it's hard to come by this observable, yet it's what one wants to extract from the data because it contains information beyond the simplest (single-field, slow-roll) inflation scenario. This simplest scenario predicts the temperature fluctuations to be to very good precision a Gaussian distribution. If they were exactly Gaussian, the three-point function would vanish, and all higher-order correlations would follow from the two-point function. A non-vanishing three-point function would thus be, here it comes, an indication for the non-Gaussianity of the temperature fluctuations, and an indication for new physics. However, the important thing to note is that the uncertainty in these observations will go down in the soon future, with the WMAP 8 years mission results one expects a 20% improvement on the bounds, while Planck can yield a factor of 4. Now if there was an indication for non-Gaussianity this would be very exciting. Then the question is of course, what is the physics behind that? What I guess is going to happen is that anybody with their model will predict non-Gaussianities. I wouldn't be surprised if suddenly it will be a signature for cosmic strings, evidence for the multiverse and also a prediction of Loop Quantum Cosmology. It will certainly take some while to sort out these things. In any case however, I am sure it is a topic you will hear more about in the coming years. Can't we all get along? Voigt profile! Everybody stays employed by carefully avoiding any exclusionary conclusions. If Voigt is nekulturny, the old standby is an upgraded tortoise and hare race refereed by Zeno: a Yukawa potential. Shouldn't there be some Feynman diagram type approximation to calculating the three point function from two point functions and some "vertex" whose strength should be deducible from the data? instead of this equilateral triangle, etc., type stuff? The dark flow or CMB polarization patterns aren't such "Non-Gaussianities"? I'm not sure, if we aren't talking about the same things, just under different names. 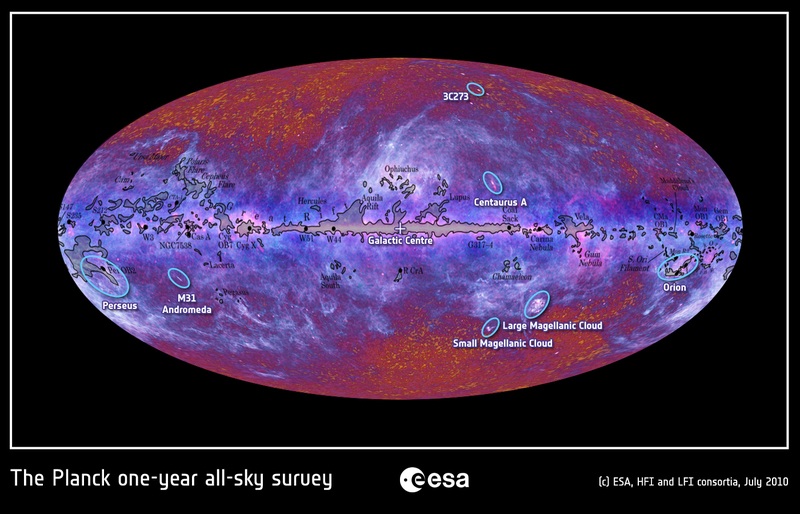 The first one-year all-sky survey from Planck is in, Bee. Clcik here to see it. Check out the NW and SSE quadrants, Bee, and dig that crazy detail. The messy stuff in the middle is our galaxy. Has anyone implemented three point Monte Carlo sampling yet? I've been reading the paper by Bennett, et. al., on hunting for anomalies in the 7 year WMAP data over the past few days on my spare to/from work hours. I'm probably going to spend the rest of the week @ 3 hours a day digesting it, because there are serious lessons to be learned there. 1) The WMAP people _LOVE_ spherical harmonics. No surprise there, but I've never seen spherical harmonics used so frequently. Ever. 2) Every one of the supposed detections of non-Gaussianity and other such anomalous objects has amounted to either an expected low probability feature of the Gaussian distribution (example: the cold spots), or was an artifact of the chosen weighting function. Or some other variant what was termed 'a posterior' choices of data, eg - cuts of the sky, restriction of multipole ranges, etc. Zephir - neither of your suggestions survived scrutiny. Sorry. In analogy when Wayne Hu spoke of such correlations so it was with the understanding that we would look at the Cosmos much differently then we have always had. This shift in perspective, is much like Helio-seismology, looking at correlations in relation to the three body problem in terms of Lagrangian? If you remove Gaussion Coordinates (a non euclidean description of the geometrics?) from perspective, THEN, you are settling for the three-point function? It is always easy for the layman to see the desire for one part of investigation correlated with another, so, if one was to expect the normal Gaussian distribution, then, what experimentally "in theory" would be it's counterpart in the new physics? Not what you assume will be exploited by different areas of research to tow the new line of theoretical definition aand prospect. Thanks for your explanation regarding the current explorations of the cosmic fossil. When it’s all said and done what comes across for me is that despite much effort the sensitivity of the instrumentation used to gather the data is still not what we would like it to be. Another thing that confuses me is as it appears even if the distribution turns out to be non Gaussian it still is close to being so and such shouldn’t the questions centre around why this should be? In many ways it’s like looking for a needle in a hay stack without even knowing what the needle looks like or even if it is there. As with Fermi, the idea is to increase our capabilities of vision(window on the universe) as our technologies are developed? Theoretically new experimentations will either add to that perspective or will not. Any presumptions of a failing theoretical process not suited to experimental testing will either have to wait until the experiment is produced, or until the results of the experiential are successful? Plato, in my link I gave a much larger version. Now boys, let's not start a foolish debate about whose is bigger. Let's debate which is cooler. 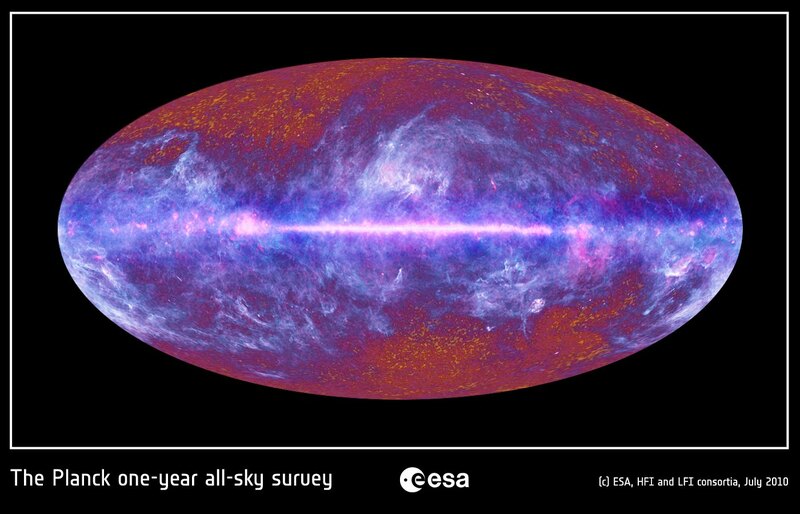 I submit this Chromoscope of the Planck Galaxy/CMB 1-yr Survey, in which you can continuously adjust (in an interactive way) the wavelength view between gamma rays and radio waves. Tres awesome? And of course, credit must be given where credit is due, that is to Phil Plait's article of Bad Astronomy from July , here, who turned me on to the Planck photo/chromoscope, and who is after all the biggest of us all. Wish to compete? Provide a Chromoscope for WMAP, and for extra credit: COBE. Yes looking back your link is a "Nicer image." I should of followed up. Sorry mate. Also, thank you for Bad astronomy link. That was very helpful. "Another thing that confuses me is as it appears even if the distribution turns out to be non Gaussian it still is close to being so and such shouldn’t the questions centre around why this should be"
I think I see your point. That is just as the orbit of mercury or the bending of star light around the sun would have indicated that gravity was not totally explained by an inverse square relationship. This of course ended in having time included as a dimension which was not describable with a mathematical description that only accounts for the action within three degrees of freedom. Still though it would be nice if a theory was proposed that predicted what these differences are which then could be reinforced or denied as the measurements are refined. And yet that is what the observation of the phenomena is supposed to accomplish. That would indicate to me there is something wrong with the objectives of science if the only criteria for having a theory be considered worthy is if all it has to do is serve as an explanation of phenomena. Personally I think it has drifted away from other things that should be considered with it all beginning with QM allowed not to be assigned a complete explanation simply by having others before to be deemed as classical. The hope is of course a new theory would clarify things yet I can’t shake the feeling this is not possible until the fundamental questions are better understood. That is why for instance I like your box problem paradox as it forces such things to be re-examined again. ”"The supreme goal of all theory is to make the irreducible basic elements as simple and as few as possible without having to surrender the adequate representation of a single datum of experience"
"That would indicate to me there is something wrong with the objectives of science"
As they say you’re the doctor and thus I will take you at your word that the data as it’s refined should serve to point the way. Also thanks for the analogy as I do remember all the goings on in respect to the solar neutrinos with some saying at first it indicated what we thought about stellar processes was all wrong as a result. Actually I can remember a time when they thought neutrinos had no rest mass and therefore travelled at c which was finally observed not to be the case. Well anyway it’s been some time since Penzias and Wilson first thought their detection of the CMB was resultant of some bird dropping in their antennae and we are still dealing with the repercussions of what it has to tell us. ESQG 2010 - Finally here!